IMPORTANT: If you have received a pink and white juror qualification questionnaire, please log in to eJuror to complete the form online or mail the form back to the Court in the provided prepaid return envelope. Use this form to submit a question about upcoming jury service in the Northern District of Florida. You will receive a response to your question within one business day. If you require immediate assistance, please call the jury administrator at (850) 521-3705. 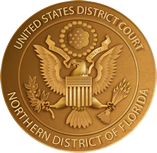 Click here for important information regarding phone and email jury scams in the Northern District of Florida. Do you have questions about jury duty? If your question isn't addressed on the jury duty information page or our frequently asked questions for jurors, please call the jury administrator at (850) 521-3705 or ask a question using our online contact form.